Are you ready for Mudhoney to get political? 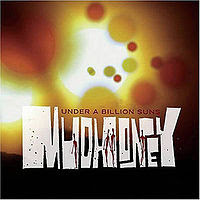 Under a Billion Suns is actually a lot like their previous LP, Since We Became Translucent. Both begin and end with monster songs, both have a few tracks in the middle that aren't too notable, and like I mentioned previously, they both have horns. However, Under a Billion Suns tends to rock a little bit more, and that's never a bad thing. After the wide-open weirdness of "Where Is the Future," the opening track that finds Mark Arm wondering why we don't have flying cars yet (? ), the band gets a good one-two punch together with "It Is Us" and "I Saw the Light," two tracks with thick layers of guitars and nice build-ups. "It Is Us" is the first song where you get the vibe that Arm is getting worked up about the state of national affairs, talking about bombs and whatnot. This continues in a later track, "Hard-On for War," and possibly in a few others, depending how you want to look at them. Admittedly, it's weird to hear Mark Arm singing about anything serious, but it does make a nice switch from the vagueness of most of the other lyrics on the album. And while Mudhoney albums used to be as much about the lyrics as they were about the music, the longer the band went on, the more it shifted towards the music side. This record features some of their more complicated tunes (the horns certainly add another element), and they still seem eager to experiment, which is great. This record ends strong, with "On the Move" and "Blindspots" (the third-to-last and last songs, respectively) being two of the best songs on the album. Mudhoney were full-on veterans at this point, and though the songs aren't quite as strong as they may have been 15 years previous, they're smarter and more confident. And that makes it really fun to listen to.